Taberna Almendro 13 is located in the neighborhood of La Latina, and area which once encompassed the first settlements in the city of Mayrit (Madrid) around 900 and later the Muslim quarter of the city once it was under Christian rule. Cava Baja was the road that surrounded the city walls in the middle ages and since that time has been the location of posadas and restaurants serving the culinary specialties of “immigrants” from around Spain. Today, this area is considered one of the best places for Tapas and quality wines by the glass in Madrid. 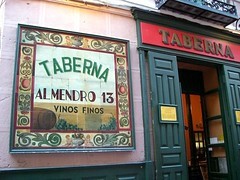 Taberna Almendro 13 was one of the first bars I was introduced to in city, and has remained one of my favorite Tapas bars in town. It is at number 13 on the appropriately named, Calle Almendro, for the courtyard next door housing several almond trees which sprout beautiful blossoms in late winter. Taberna Almendro is a non-fussy bar that serves only clear beverages such as beer, white wine and sherries such as fino and manzanilla. No Coke. No red wine. Ask for the interesting Barbadillo white wine. The name is actually Castillo de San Diego, but Barbadillo will get it to you faster. Barbadillo (warning: loud music on website) is a major sherry producer located in Sanlucar de Barrameda, renowned for their white sherry wine made with the indigenous Palomino Fino grape varietal. The flavor much resembles the nutty flavors present in many sherry wines, but in a drier and lighter style. The food is simple but excellent, not expensive, and therefore in high demand. It’s always a bit of luck or a matter of standing your ground to get a table. There are no waiters, so order your food and drink at their respective counters. Remember olives come free with your drinks. I recommend ordering a rosca which is a sandwich of bread baked in a bagel shape (share this with one to three others). You can have it filled with cured ham, lomo, cheese etc. I always order the “Huevos rotos con jamon” which is a Madrid specialty containing fried potatoes topped with bits of ham and “broken” fried eggs. They also do salmorejo (a creamy cold soup containing tomatoes, garlic, bread and salt all whipped together into a delicious concoction) and simple salads. This taberna is pure Spanish with a rustic flair. If you want a table, go early, around 8pm. Otherwise you can always wait in the line which forms on the stairs going down to the vaulted basement of brick walls hundreds of years old.